Our host in Ann Arbor Jayanthi giving Josh and the evening’s dinner a ride to Morgan and York. We’ve officially made it through our first leg of the tour. So far, every night has gone swimmingly. After a sold out show in Ann Arbor at Morgan and York, we spent our last night in Michigan at the Jam Handy, an old film house in Detroit currently being repurposed. 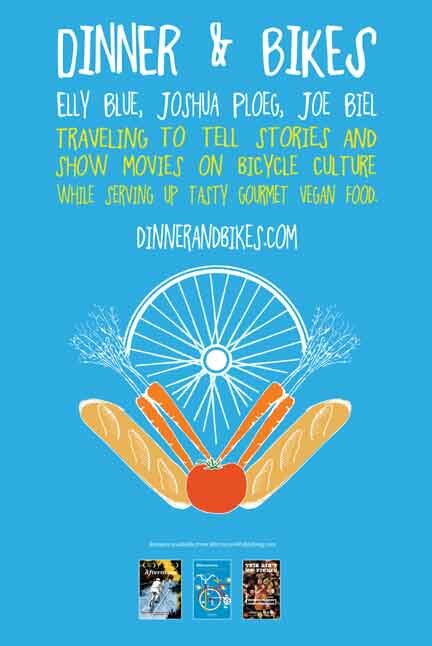 A sold out crowd representing many local organizations spent the evening dining on a Mexican themed buffet from Josh and we’re happy to say we saw many people networking and building ideas for a more bike friendly Detroit. We then headed off to Cleveland for yet another sold out show at the Old Stone Church put on by Bike Cleveland. This was one of our largest events of the tour so far, and we had an amazing dinner style setup which allowed everyone to spread out and get to know each other better. We dropped by the Ohio City Bicycle Co-Op on Friday morning to give another presentation on bicycling economics and infrastructure and screen some of Joe’s Cycling Shorts. Our group had a lively discussion about how Clevelanders could better engage the city in creating a more bikeable and safer city. We took a little break in the evening for a book signing party at the Joy Machines Bike Shop, and are so grateful for the hospitality and fun we had in Ohio. On Saturday, we brought our show to the Grant Street Neighborhood Community Center in Buffalo, thanks to the Massachusetts Avenue Project, GObike Buffalo & Burning Books. We had a very restful night off in Ithaca last night and are all set for our event at St Paul’s Church community dining room this evening. Tomorrow, we’re heading to Syracuse and Wednesday we’ll be in Schenectady. We hope to see you soon! The first meeting of the Portland Society will be on Wednesday, June 16, 2010 from 8:00am – 9:00am at the Urban Grind Coffee House, 2214 NE Oregon St.
We’re pleased to announce that Suzanne Atkin, a public speaking instructor and organizational communications consultant (she owns a small business, Workplace Harmony), has agreed to give a presentation on public speaking. You’ll learn to pitch your business in a concise, compelling elevator speech. Welcome to the online home of the Portland Society. Our goal is to bring together women who are passionate about business and bicycling in Portland, Oregon. To stay up to date about meetings, events, and opportunities, please join our mailing list.